Unitech – A ‘Buy’ recommendation. 1. Unitech is one of India’s leading real estate company based in Gurgaon. 2. It is my personal opinion that now is a good time buy the Unitech stocks. 3. Rationale for my opinion is laid out in the rest of the story. 4. If you are ignorant of the stock market and not knowing how to start, a link to my amateur article has been provided. 5. I am writing since I love to write. I also genuinely believe the stocks are a way to financial freedom especially from India which is the world’s only fastest growing big economy. If one person profit from stocks due to my initiation that will be very rewarding. Let me clarify that I am neither qualified in financial matters nor I am a professional financial advisor. My advice is based purely on the experience of using the ICICI share trading platform for investing in stocks since 2005. My comments below are also based on the learning and monitoring of basic economics, geopolitics, sectors, and businesses that is essential to investing in stocks. I must also warn you that stock market investments are inherently risky but is it not with the risk that reward comes? Hence, it is up to you to draw conviction based on my amateur advice and rather naive analysis of possible future profits. However, over the years of roller coaster ride in the market, I can assure you that my sense of stock price movement has sharpened. 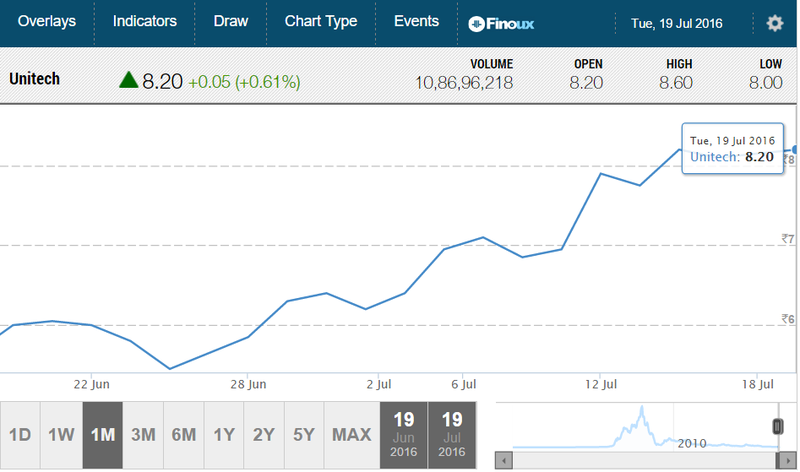 Hence I am venturing on a relatively risky advice recommending a stock ‘Buy’. They are a leading real estate developer in India based in Gurgaon. Real Estate Company’s in general performed well in the stock market just prior to the 2008 financial crisis that affected share prices of all sorts of businesses. I bought this stock for the first time as early as 2005 and bought and sold many times ever since. I am still sitting on a huge loss. However, since the past few months I am sensing a real turn around in the company and the sector. I believe that this change will again take the stock back to its glory days to a few years from now. Positive factors: my rationale for further investment. Real estate as a business sector has recently undergone several positive changes which are good to build confidence in the sector. 1. A regulatory authority has been setup by Govt. of India very recently. “The Real Estate (Regulation and Development) Act, 2016 is an Act of the Parliament of India which seeks to protect home-buyers as well as help boost investments in the real estate industry.” Regulatory authority is expected to improve the overall market positively. 2. RBI governor Dr. Raghuram Rajan’s successor is expected to pursue lower interest rates as that is one reason Rajan was often at odds with the business community and some from the Govt. This is expected to help the real estate sector as the real estate is a rate sensitive sector. 3. The recently announced central Govt. pay rise to the tune of 23% is expected to put more disposable income with a large section of the public. 5. GST Bill which is the most important reform under Modi govt considered as the greatest Tax reform since Indian independence is about to be passed by the parliament because Congress opposition to the bill is looking increasingly unsustainable. This will be a big morale booster for domestic and international investors. 1. “Unitech Wireless is one of the accused in the 2G spectrum scam. It is alleged that they were able to attain 2G licenses by bribing officials in the Indian Government even though they didn’t have any previous telecom experience. As a fallout of this they had a total of 22 licenses cancelled by virtue of a court order and their Managing Director, Sanjay Chandra was sent to jail.”” – Extract is from the Wikipedia. 2. They are also facing several court cases due to delays in delivery of the apartments from general public. The situation, in my opinion, is also due to the prevailing situation of poor sales in this sector till recent past. 3. Other risks are all too common such as how a company conduct their business generally as in any business and any other risks such as political, economic coming out from India or from across the globe. There are thousands of parameters that can actually move a share price up or down on a daily basis. But over the years, it is the company’s performance and outlook of the sector that underpins a stock performance. 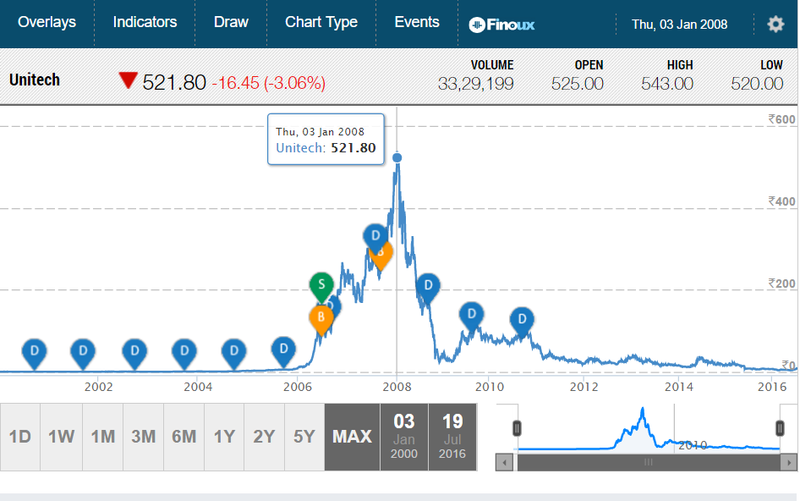 History of the Unitech share price movements: source: moneycontrol.com. As you can see below, at its peak somewhere in 2008, before the financial crisis as a result of the subprime crisis struck the world, Unitech’s share price touched Rs. 521. But several years later today it is languishing at a price of around Rs. 8. As you can see in the graph on top, once it climbed down it more or less stayed there like a dead brat for a very long time. But in fact during this period, the whole market remained dead for year’s together. It is after Modi became Indian PM and global market conditions also started improving, change started becoming visible in the price of all stocks. See the above graph. This is for the last one month. The interesting thing is that the price was at Rs.6 a month before. Note that in a month almost 25% rise has been achieved. All indication is that this is going further up. “What goes up comes down” and in shares what comes down also goes up provided the management is capable and business sector is prospective. Real estate is one of the main sector of investment for Indians and it is an all-weather instrument for Indian investment. Unlike past governments, PM Modi is quiet clear on where he wants to go with the Indian economy. His priorities are clear and he is working hard to achieve his targets. Hence one must note that a huge shift is on the horizon. The change will not only affect the real estate sector but all other sectors will benefit from this tectonic shift under progress. His policies are not only helping Indian economy to develop, but also India’s stature in the League of Nations is undergoing a promising change. I would like to encourage entering into the stocks at this time in country’s progress when there is an enduring difference on the horizon. Please follow the below link to find out the real estate sector outlook as explained by the Economic Times in June this year. Attaining financial freedom: the mirage that is for most people. There are a wide array of things that can have a bearing on the prospect of your stock positively and negatively. But as the saying goes, there is no gain without pain. Hence it is still worth taking that risk. Also in stocks the time that you enter matters. However, it is impossible to time the market to buy low and sell high. What matters is your capacity to stay invested and whether the storm if any, over time. There is also one school of thought that says “fill it shut it and forget it” that translates to buy the stock that you think will do well (in future) today and not touch it for years to come. In stocks, this approach can be very well followed and many people have taken this approach very successfully. If the management and the sector performs, you are very likely to make money no matter what happens in the rest of the business world. Unfortunately the above statement matters to investing in stocks. It does not matter whether you stayed put with your money for a decade, the huge upturn might just happen the week after you have left, you miss that week and you miss a decade. Battle for financial freedom is one battle worth taking. Stocks are no doubt one nice route to that independence. It is not an easy one. Stocks are one strange animal that takes time to tame but it is not impossible. Around ten years back when I got very excited with stocks, I wrote a long piece in a site I am associated with which I think will give you the basic understanding of investing in stocks and an insight into how this world works. However, again this is from an amateur’s perspective. Online Share Trading Guide. T. P. Gopinath. Articles – CalicutNet.com. Stocks are undeniably the most risky investment and asset class. But what I found from my experience is that it is one of the most exhilarating roller coaster ride you can take if you have enough patience and mind to spend time to learn about the basics of business, sectors, economy, and open your mind to developments in national and international politics and specific events that might have an economic impact. I have been somehow able to do that till now and the interest hasn’t waned in spite of a loss of capital.